Our review of the product Pure Density Hair Nutrition made by the company Toji follows. The manufacturer of this product claims that it contains 34 active ingredients that can comprehensively improve the health of your hair. Read on, to know more about its ingredients as well as our opinion of whether it is the right product to take for the health and growth of your hair. It is recommended that adults take four tablets of this product daily, two in the morning and two at night, preferably with food and water. The side effects of this product are quite rare which is why it is considered safe for long term use. However, it does contain soy, and since every person is different, it is recommended that you take a look at all the ingredients carefully and consult your physician before using it. In case of an allergic reaction to any of the ingredient in the product, you should contact a doctor immediately. The list price of this product is $14.95 and consists of 120 tablets which are enough to last a full month. The manufacturer also offers a ten percent discount if you purchase three bottles of this product. The manufacturer of this product offers a hundred percent money back guarantee. So, if you are not satisfied with the product then you will be provided a full refund including the amount of shipping without any hassle or questions. The manufacturer has also specified that you have up to sixty days to return it after purchase. The reviews of this product are also positive. 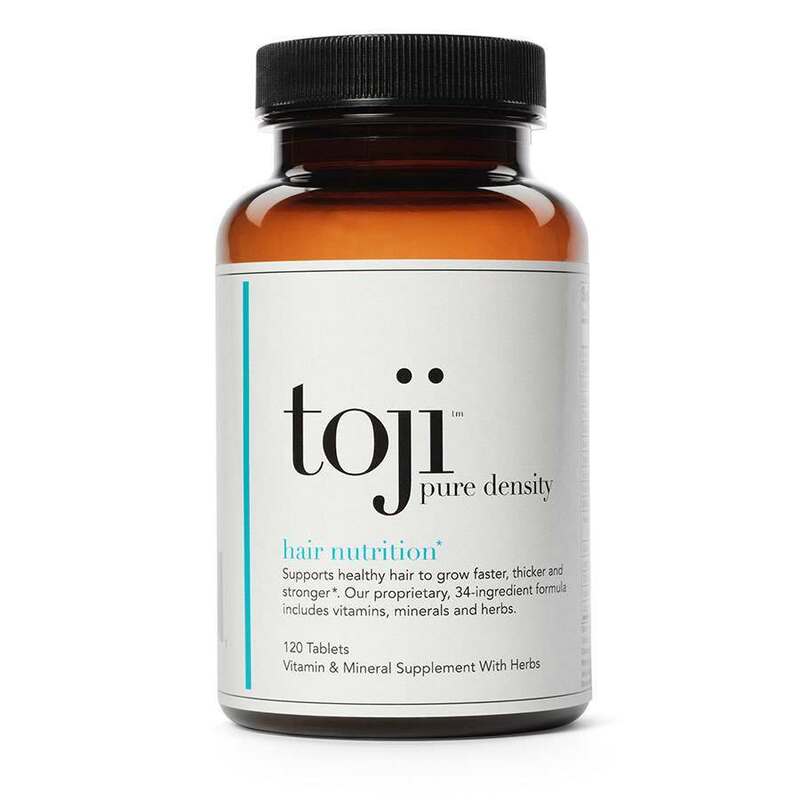 Pure Nutrition by Toji is a vegetarian hair nutritional supplement that has 34 active ingredients combined to improve the health of your hair and make it strong, thick and long. The manufacturer of this product claims that it provides nutritional support as well as hormonal and circulatory support to our body. So not only has it been designed to address the nutritional deficiencies of our body but it can also stop the hair loss caused by any hormonal imbalance or the poor circulation of blood to your scalp. However, 120 tablets just for $14.95 does raise a few concerns about the quality of this product. It also contains soy and as a result, can be unsuitable for various individuals. John Brownstone	reviewed Toji Pure Density	on July 29th	 and gave it a rating of 4.